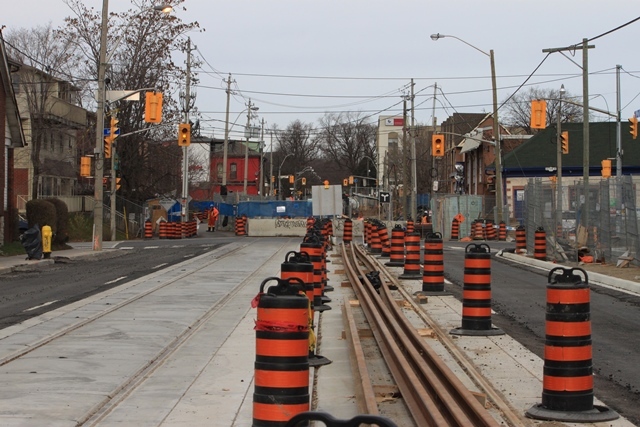 Updated August 7, 2015 at 6:00 pm: Leslie Street will reopen to traffic using the completed streetcar lanes and the west curb lane on August 8. Work will continue to rebuild the east curb lane and sidewalk. Updated July 28, 2015 at 12:30 pm: Recent construction photos added. Updated July 17, 2015 at 2:10 pm: Recent construction photos added. Updated June 24, 2015 at 5:00 pm: Recent construction photos added. Updated May 28, 2015 at 2:00 pm: Further information about the design of the track support structure has been added at the end of the article along with historical links. 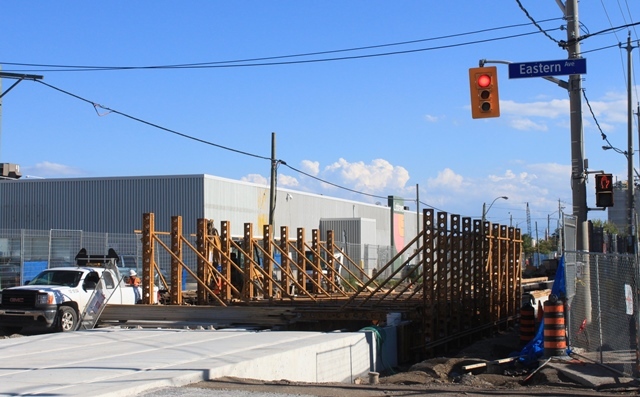 The seemingly endless work to rebuild Leslie Street south of Queen as the access route to the new Leslie Barns hit another setback with the discovery that a section of track was installed at the wrong elevation. This affects the road profile, drainage patterns and the access to an adjacent condo where residents had expected they would be free of side effects beyond the nuisance of construction. 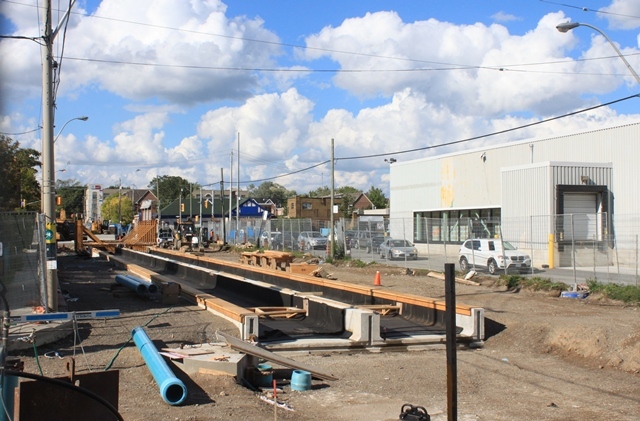 A surveying error by the contractor, Pomerlau Construction, who have responsibility for the entire Leslie Barns project, caused about 60m of track just north of Eastern Avenue to be installed roughly 9cm above the correct level. To explain a bit about the structures involved, here are photos from the Leslie Street project. The view below looks north on Leslie toward Eastern Avenue, and shows the “tub” form which was cast along the length of Leslie to hold the track structure. The purpose of this, as opposed to the usual base slab plus ties, is to distribute the load in a self-contained structure. 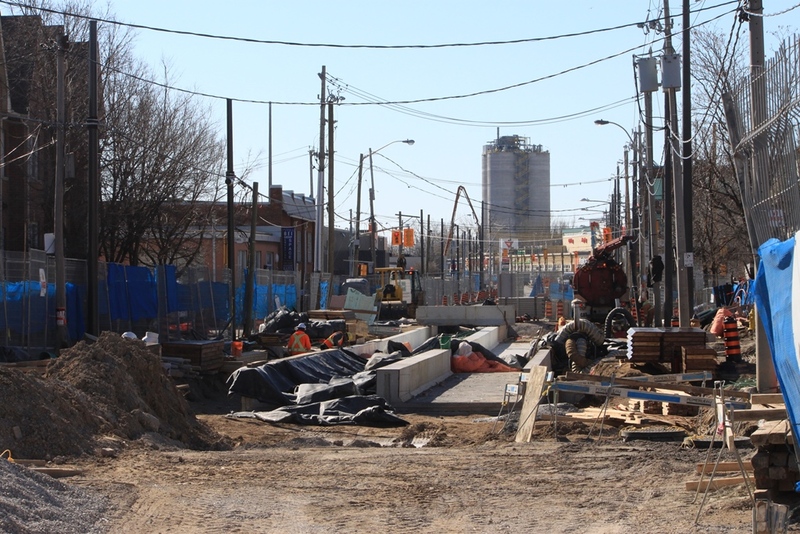 A rather messy view of the “tub” under construction looking south to Eastern Avenue (the area behind the barricade in the photo above) on April 1, 2015. This gives a sense of the conditions residents have lived through during this project. 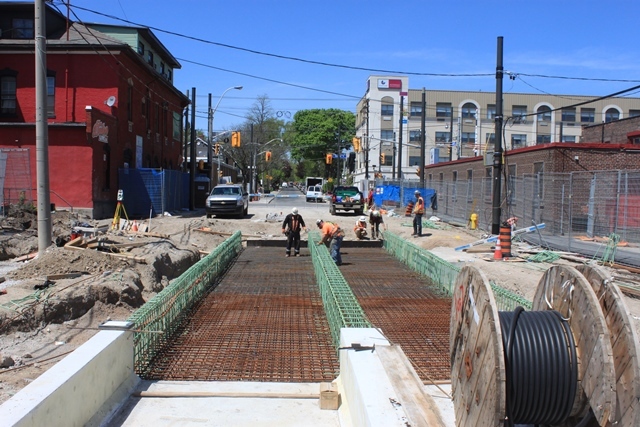 Here is a view looking north to Queen on May 14, 2015, showing the internal structure before the “tub” is concreted. And then north. The affected condo is on the west (left) side of the street. Remove the portion of the track and the “tub” in which it rests and reinstall at a lower elevation. Concurrently repairs would be made to the parking ramp into the condo which was damaged during construction. Slice the tub walls to shorten this structure and adjust the track height accordingly. Raise the road grade. This was originally thought to be the simplest fix, but it would affect both the ramp into the condo’s parking garage and the drainage from the street. Option 1 is the preferred choice, but it will delay the full reopening of Leslie Street by about 5 weeks. A final choice will be settled this week so that construction can begin as soon as possible. Meanwhile, Leslie Barns itself is close to a year behind schedule, and only the similarly late delivery of Flexitys from Bombardier has prevented a storage crisis at the TTC’s carhouses. As things stand, two dozen cars are stored overnight at the CNE Loop to provide some elbow room for construction projects at the carhouses and space at Roncesvalles for the Flexitys now in service. The entire Leslie project has been plagued with problems from the outset including issues with site selection, the need for site remediation and relocation of a high-voltage hydro conduit, and the extensive set of utilities, including a very old water main, under Leslie Street. The project is well over budget, and shares with another major TTC project, the Spadina subway extension, questions about the degree to which conditions were properly understood before it was approved. I will update this article as the story unfolds. See also stories in the Globe & Mail and the Star. Updated May 28: The following links show maps of the area before it was filled in to create the Port Lands were moved here from a reply in the comment thread. Goad’s Insurance Maps for 1884 (key map for Toronto). With thanks to Nathan Ng for his excellent site indexing all of these maps. Updated May 28 at 2:00 pm: The purpose of the “tub” track structure turns out to not be a function of load distribution on the soil below, but to act as a container for a “hockey puck” like substance that will provide vibration isolation between the track and the roadbed. This is similar to the design used on new subway lines where there is a layer of large discs between the concrete ties under the track and the floor of the tunnel. July 7/15: Looking N to Queen from Eastern. 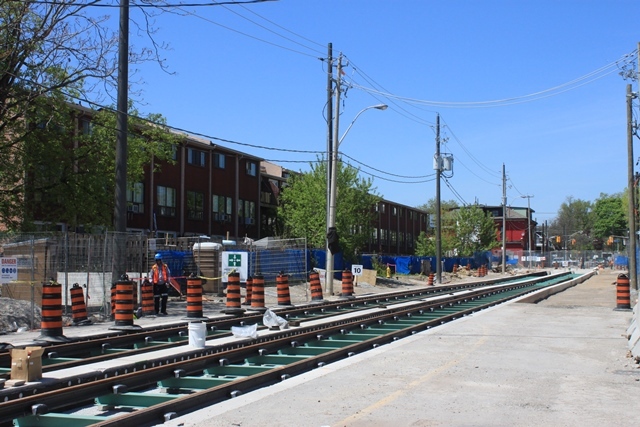 July 16/15: Looking S toward Eastern Ave.
Track construction is now complete between Queen and Eastern, and paving of the south curb lane is in progress. South of Eastern, the west side of the street is as yet unfinished. This entry was posted in Streetcars, Transit. Bookmark the permalink. Poor Leslieville, project management has not been kind. From the tweets of the ttc board mtg sounds like we are in for another wild ride in Scarborough. Let alone all the problems with the logic of the project, having the board set contracts in motion before the route has been decided seems a little crazy. I thought 4-5 weeks seemed rather long for just redoing 60 metres of track, based on what we’ve seen on regular track replacement work. However, those tubs do look more complex than the usual construction technique. Why use them? Is it an attempt to distribute the load more, to preserve the underlying sewer? Steve: The main concern is that the land is not strong enough to support the track structure, although I cannot understand why the usual three layers of base slab, ties and track wouldn’t achieve the same thing including distribution of the load. How small is the load bearing ability of the sub base? I could understand if they are concerned with the load under shear of concrete, if the sub base requires a very large area to absorb the load, however, that would really mean a very poor substructure. Steve what is the history, is the soil in this area largely loose pack fill? Steve: The thickness of the base of the “tub” structure is comparable to the base slabs being poured in any recent track project. The land there is very sandy, and south of Eastern Avenue used to be underwater. See the maps I have linked at the end of the main article. Part of me wonders if Leslie is being used as a testing site for this form of track construction for use with future projects and the soil conditions are just a convenient excuse. According to the Mop & Pail, TTC spokesperson Susan Sperling said that the track was 3 1/2 inches too high, which is about 9cm. Even in the chaos of construction seen in the photos, that’s quite a bit to miss. Speaking of said chaos, you have to feel sorry for the residents. I’ve noticed when crossing this track on a bike along Lakeshore that this track seems to be unusually raised. I know this is south of the affected area, but this track definitely has a higher vertical profile than crossing track anywhere else on the system…something you particularly notice when crossing on a bike. I am wondering if they have constructed the tub, so that the edges create a more effective beam, and thereby extend the load along the length of the tub more effectively, providing additional strength along the section. However, I do not know what the reinforcements within the concrete that have been tied in with regards to how the entire section is being made. I would think the sub base you describe would not provide a great deal of load carrying capacity, so it would make sense to have a cross section that would increase the ability to spread the load. However, it is surprising given the very high level of structure that they are already pouring that this would not suffice. Steve: The tub structure is full of re-bar. I will add a photo of this to the main article. I thought it was “measure twice and cut once”, not “measure once and cut twice”? I think there were real issues with the decision as to where to place this facility, but it was such a dire situation the rush was on to avoid alternatives and options, though there was a real case for options being far cheaper. So – don’t be stampeded to not interfere with “Progress”? Short answer: yes. The best example is the now abandoned railway spur crossing the Lakeshore bike trail to the east of the Don river. Long answer: it’s complicated due the wear that occurs with frequent streetcar traffic in addition to wear caused by other road vehicles and the damage caused by salt during the winter. Steve: I assume that you mean this crossing (Google Street View). Note that it has soecial inserts between the rails. These may survive ok with only cycling traffic, but out on a main road with heavy truck movements may be a different story. There also was (maybe still is?) special treatment of the railway tracks on Strachan south of King for cycling. The profile of railway track in the road is different with a much deeper flangeway for the type of wheels used on mainline railway cars. It’s not an impossible design problem, but not a direct apples to apples comparison. To date there are about say 4 usable (ie. revenue generating) LRV’s that are delivered and in operation. Maybe 30 by Dec. 31, 2015. Maybe 60 by Apr. 2016. It will take a year for the Leslie St Barns to be commissioned. When does TTC run out of room to store these additional “New” streetcars? Steve: Your math is off. First, there are 6 cars now in revenue service (4400, 4403-4407), but yes the TTC hopes to have 30 by yearend. The delivery rate is supposed to ramp up to one car every five days in July 2015. Whether this happens remains to be seen. On the assumption that it will, that would give us, say, 50 more cars in 2016. Leslie Barns will be commissioned in late summer or early fall 2015, not a year from now. If this does not happen, but new cars really do arrive at the expected rate, the TTC will be in trouble by the end of the summer. Cars are already being stored at Exhibition Loop. Steve, this is just more incompetence on the part of TTC boss Andy Byford and I hope that Mayor Tory appoints a new TTC CEO soon. When does Byford’s contract expire anyway? I can’t wait for the new streetcars to run on Bathurst, when will they start running on Bathurst? Steve: Byford is about half way through a five-year contract. I do not know when Bathurst will get new streetcars as this depends on the rate at which deliveries from Bombardier ramp up. Not quite related to this, but nearby… I passed by Russell the other day, and saw that they’ve completely excavated the track and switches on Eastern. I’m guessing operations are interesting there, as streetcars all need to be backed in now. Do you know when that project is supposed to be done? Steve: Sometime in the fall. The track will likely be finished before other related road improvements. I would think given the way that appears, that the portions that form the sides of the tub, really would add a good deal of structure. I would think that it would increase the ability of the structure to spread the load along its length better than a slab would, however, I am still surprised that this would be required. It looks like it becomes a very substantial job to build these. This structure looks like it would greatly increase the amount of labor in setting the rebar, and for prep to pour. Steve: Most of this structure was built with the assistance of a travelling form, and this short stretch was left over. There is a photo of the form here in my article last year on Leslie Street construction. There also was (maybe still is?) special treatment of the railway tracks on Strachan south of King for cycling. There wasn’t much in the way of special treatment for the railway tracks on Strachan; at least not in my opinion. Just rubber inserts around the outside parts of the rail. Cycling over those tracks was not particularly pleasant. That railway corridor has now been lowered into a trench, and Strachan crosses over it on a bridge raised slightly above the level of the old road. My records show car 4406 being delivered on Feb 28. When was car 4407 delivered? Steve: It left Thunder Bay in the third week of April and was in service by mid-May. Your records are clearly incomplete. Has that contract achieved “Substantial Completion”? How much of a gap will there be between enough track work being completed for the barns to be usable, regardless of overhead, and its commissioning? The TTC might be able to buy a little time by using the site for temporary storage of CLRV’s and ALRV’s awaiting repairs or retirement even if they have to be pushed/towed in by truck. Steve: I don’t know the specifics of what is finished, but there is already some overhead up in the yard. It is quite clear that the TTC intended to use this as soon as possible, although this has been delayed by the fiasco with the track north of Eastern Ave. The concrete tubs between Queen (south side) and Eastern, north side (match the as built tubs north and south). 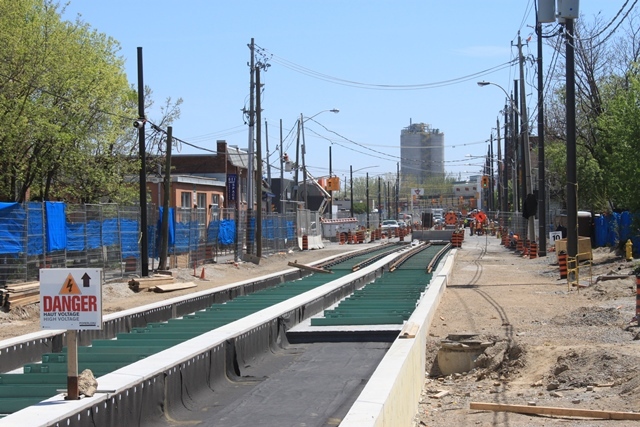 Rails in these tubs (installed) just south of Queen match the rails on Queen. They have to. The concrete tubs match the elevation of the tubs beneath the Leslie/Eastern intersection. Steve: At a point north of Eastern, the track structure is too high. This affects the height at which the surrounding road would have to be built, and in turn the sidewalks, and it turn driveways that cross those sidewalks. The specific location involves a ramp out of an underground garage whose grade would have to be altered to match the new sidewalk level. It’s not just a question of lining up the track. So, tub construction reduces vibration presumably for streetcar tracks passing through residential areas. Is Leslie Street the first time that tub construction was used in Toronto? Steve: Yes. I’m not sure that I buy the premise, but the “soil” is very weak especially south of Eastern Avenue where it is all landfill. The rubber encapsulation of track used everywhere else (and on Leslie too) seems to do just fine. That is 22 trains in seven months. The last train was delivered, like about 5 or 6 weeks ago. Steve: I have a query in to the TTC to explain what is going on with streetcar deliveries. They still expect to have 30 by the end of 2015. One thing that is not clear is whether 4408 is the last of the “bad” cars with production problems in Mexico, and whether its problems are a continuation of old news. Bombardier is supposed to be delivering one car every five days starting in July. Taking that interval as a work week, there are 26 weeks in the seecond half of 2015, less a few for Christmas vacation. If they can actually achieve the claimed production rate, then we will have the expected cars. I will believe this when I see it. Considering that they were supposed to be up to deliveries once every two weeks back in April and 4408 is only now being shipped to Toronto, I think it’s highly unlikely they will hit that production rate this summer. Fall!? It seems we must continue to be patient. I noticed twice seeing a production car on a training run (4405 on May 21 and 4406 on June 5 at King & Sumach). Are the prototypes (4401 & 4402) are not available for training? Further to the points made in my last CEO Report, we continue to hold Bombardier to delivery of their revised production schedule. This commits Bombardier to a progressive ramp-up in delivery to a rate of a new vehicle every five (5) days by the end of July, such that, by year end, a total of 30 vehicles will be on property, sufficient to convert the 509 Harbourfront, 510 Spadina, and 511 Bathurst routes. They have 6 production cars already, and only need 24 more to hit that target. Tight but possible assuming that a few get here before the end of July and they actually hit one a week thereafter. But I be unconvinced until the rate of new arrivals is such that I cannot keep up with them. They have been using production vehicles for training. I have seen 4403 out during the week in the evenings for training runs which doesn’t make sense to me if the TTC intends to keep 4400 and 4403 out of service to keep mileage down. Maybe they’re trying to keep the mileage on 4401 and 4402 down. Could the older CLRV and ALRV be stored in the Leslie Barns? Steve: Yes, although a good deal of maintenance would have to be done down the street at Russell where there are pits for under-car access. Actually Steve, then the Leslie barns is useful to store some old streetcars. This little problem is a construction related problem, in particular a surveying problem, and is not in any way related to TTC or Andy Byford. The track tubs matched the as built elevations at Queen East and Eastern, they had too. They have now started to install overhead leaving the new barns and turning onto Leslie – it appears that much of the overhead inside the barn area (the Barn Yard?) has been installed. Out of curiosity Steve, do you know why they still haven’t finished that short section of track south of Lakeshore? Steve: There was an excavation open there for a long time that was only closed a few weeks ago. I suspect that they just have not gotten around to this piece of track yet.